presented by the Open Space Performunion. An exceptional workshop opportunity including a public performance with one of the most inspirational and experienced teachers we know. Mushimaru Fujieda, internationally acclaimed performance artist and dancer and certainly one of the greatest living masters of Butoh today offers in this invigorating three day workshop, which he calls „A lecture on Natural Physical Poetry, movement according to one’s own breathing rhythm“ opens your channels of creativity and gives wings to your potential in movement inprovisation. 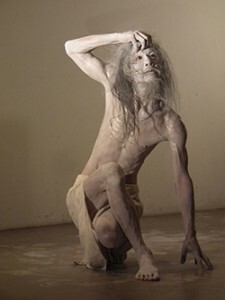 His work crosses over the traditional borders of Butoh allowing you to interpret in your own form. The workshop is open to dancers and performance artists of all levels and ages. The workshop in accompanied by the music of the acclaimed Japanese musician Aya Ogawa. Copyright © 2019 Open Space Berlin. All Rights Reserved.